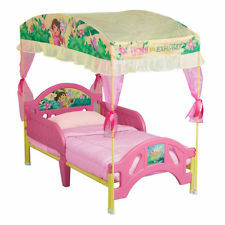 This adorable Dora the Explorer Toddler Bed with canopy will have the little explorer in your life excited about getting her rest. Raise the Safe Sleep Side Rails for more security when your child is dreaming about her favorite adventure on this canopy toddler bed adorned with Dora the Explorer characters. Bright graphics decorate the headboard and footboard with a canopy to match. With its low bed height, your toddler can easily climb on and off of this baby crib mattress when the safety side rails are lowered. Surprise your explorer with this kids bedroom furniture for a comfy good nights sleep. Uses a standard crib mattress (sold separately).